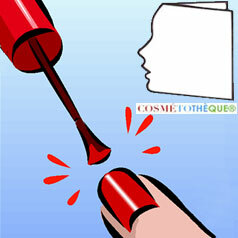 Home Articles Cosmetotheque Products Spotlight on nails! We have seen recently the nail that knows how to record your solar level exposure. Now, it’s a new nail enamel sensitive to light. And for once, something is happening in the nail enamel world! We have been accustomed in recent months to false innovations and some fanciful allegations suggesting that nail enamel would be on the path of ecology. This is not so, or so little, even if efforts are made to incorporate into the classical formulas, elements from green sources, or obtained by “soft chemistry”. But basically, the systems remain solvent-based, based on resins obtained by heavy chemical processes: nitration or plastic. As for water based nail enamel, they are trying to progress, but very slowly, and continue to be the benchmark of chemical species to thrill environmentalists around the world. One of the advances remains the semi-permanent nail enamel, obtained as everybody knowns, from acrylic monomers which are crosslinked in situ by photo-initiators activated by UV Rays. These products continue to be subject of questions, and even critics, concerning the residual level of monomers, that can lead to safety issues. In addition, the difficulties of make-up removal are also one of the recurring points. The range is called Sun Prodigy and has a fairly broad proposal based on this technology. This new range was introduced at the Bologna show, which remains the key event in our business. It’s protected by several patents relating to this innovation. This technology could have found its place in the recent article on how light can be used in cosmetics. The world of nail polish is still able to offer real innovations. This contribution was prepared on the basis of information obtained from Fiabila. Fiabila has been an expert in the world of nail make-up, and nail polish in particular, for over 40 years. Thanks to a policy of permanent investments and voluntary R&D, Fiabila is a company at the forefront of the best state of the art.